Back at its I/O dev gathering earlier this year, Google took the wraps off the new Allo and Duo instant messaging utilities. Duo, which is focused around video chat, launched on iOS and Android about a month ago to a fair amount of acclaim. Users have long been able to pre-register for the text-based messaging Allo app via the Play Store, but the grand roll-out has yet to take place. According to the perpetual and often accurate leakser Evan Blass, Google Allo will finally make its way to the end user this week. Unfortunately, Blass' utterances are quite vague on this occasion, with no specific date mentioned. 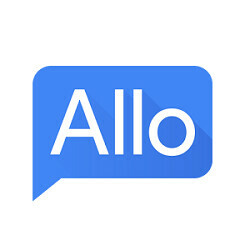 Word on the street is that Allo could arrive on Wednesday 21st September. Either way, it doesn't seem we'll have to wait much longer to see if the Big G can make an impression on the crowded instant-messaging market. As well as being closely intertwined with the aforementioned Duo app, Google Allo will link to a person's phone number as opposed to their Google account. This places it in direct competition with the likes of iMessage and WhatsApp along with many others. Whether the market's already too crowded for Allo to forge a substantial following, we'll have to wait and see. But Google being Google, plenty will surely rush to test it out once it does take its long-awaited bow. Whenever Allo does become available for download we'll have the details covered here, so stay tuned. Now that was funny lol. I'm married - I can so vouch for that statement - and absolute truth!! Post go the day for me (sadly). YESSS! I can't wait for this man. What will image 5(of 5) look like for someone who doesn't have Allo? Ohhhh. I thought One person said lets get italian and then the app would send those recommendations to the reciever. KK my fault. Finally find out how well or not Google Assistance works ready for Google Home. another google product thats DOA.......duo is already dead;just less than a month after release. So now 3 or 4 messaging apps on your phone? What about hangout? Too late Google, iMessage will remain the gold standard while Allo will be relegated to "just another messaging app"
I was looking forward to this until someone confirmed that it doesn't support SMS, but rather just messaging between other users who also have Allo. Lost all interest after that. Would be nice if it worked cross platform with iMessage. i don't want to sound ignorant, but why is this important? I have been using what's app and/or viber and i am good. Allo is the same thing. just cuz it's google? meh.